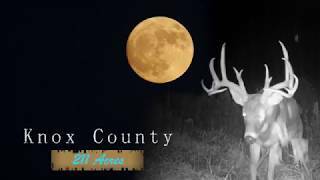 This area of Knox County is known to produce Boone & Crocket bucks consistently! The neighboring tracts are large and also managed for top end deer. Oceans of prairie grasses make up this area along the Spoon River and its tributaries, creating some of the best whitetail and pheasant habitat in the Midwest. The acreage is all enrolled in a permanent CREP program with a 10% food plot allocation and the plots are established and prepped for this season. This farm wasn’t hunted at all in October, November and only once in December! The deer numbers are massive…this past February I videoed a herd of 140 deer just a half mile north of this 211. If waterfowl, fishing and pheasant hunting are your motivations then this will not disappoint with an abundance of wild pheasant and excellent fishing in the Spoon. The property is at the end of a county road and very quiet with no thru traffic. People that appreciate the outdoors will love this parcel from the outstanding hunting to the wildlife viewing…an active Eagles nest is in a massive cottonwood along the spoon that’s easily seen from 1 of the Muddy Blinds.